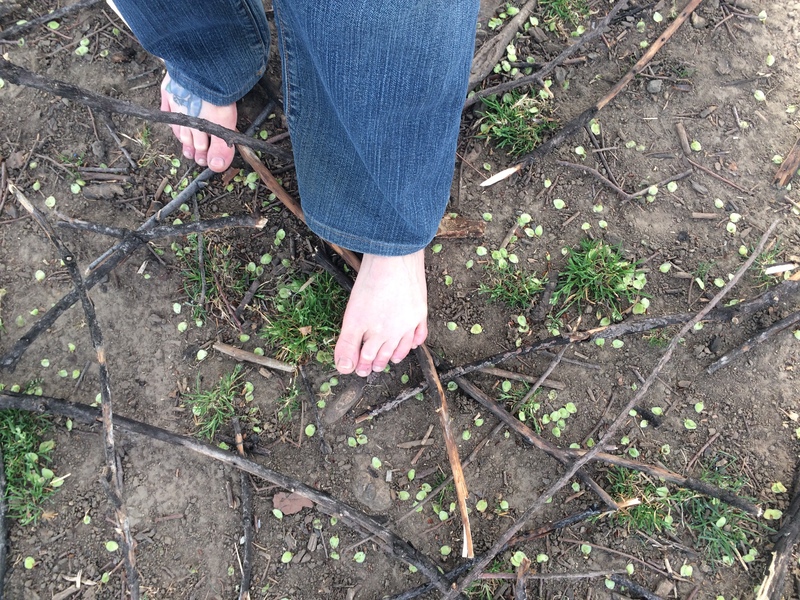 I’m a Barefoot Walkin’ Fool! 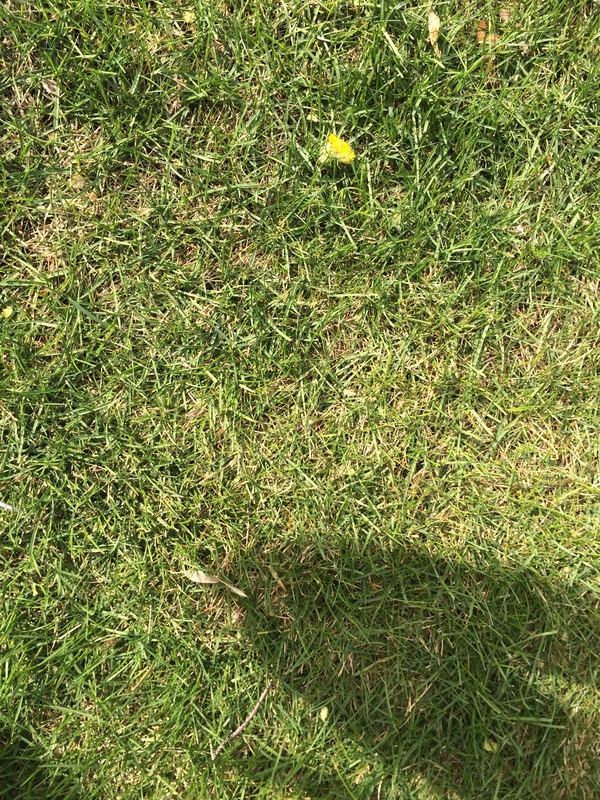 My feet would have been much dirtier, except near the end of my walk was a large grassy area that still held some dew and that cleaned them off a bit. 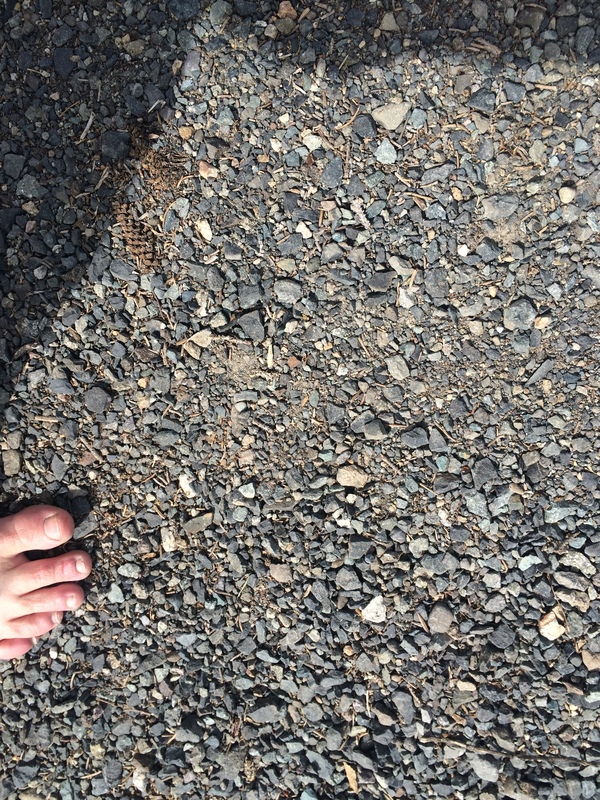 That is sap on my toe, not the turd. My foot is not as long as it appears. All standing exercises should be done in Tadasana aka mountain pose with your feet pelvis-width distance apart, pointing forward, which means the outside edges of your feet should form a straight line (you can line up the edge of one of your feet on a yoga mat to check that it is actually straight and match the other accordingly); and your hips back so that they are stacked over your knees, ankles, and heels and not drifting or thrusting forward. Keep your weight back in your heels. I call this Smart Tadasana Alignment. Lift your toes (this is called extension), spread them away from each other, and place them down onto the mat. Repeat several times throughout your day. You can improve your ability to actively spread your toes by passively spreading them using toe socks. A full explanation is linked, but the short of it is to draw the base of your big toe towards your heel, without flexing or curling your toes. It’s OK if they grip the floor. This action lifts your arch, thereby shortening the length of your foot, and strengthening the arch-supporting muscles. Hold for 5 seconds and repeat 3 times for each foot. Try to do 5 sets of 3 repetitions per day, holding for 5 seconds each rep. You can perform the short foot exercise any time your standing in yoga postures and as you get stronger, you can do it while balancing. The Short Foot Exercise is comparable to the Strong Yoga Foot. Any single leg balance will strengthen your extrinsic and intrinsic foot musculature. Once you are skilled at balancing on a firm surface, you can explore a variety of unique surfaces – a folded up towel or blanket, a yoga block, a half round, a boot tray of rocks, your yard…Hold for up to one minute and repeat several times throughout your day. 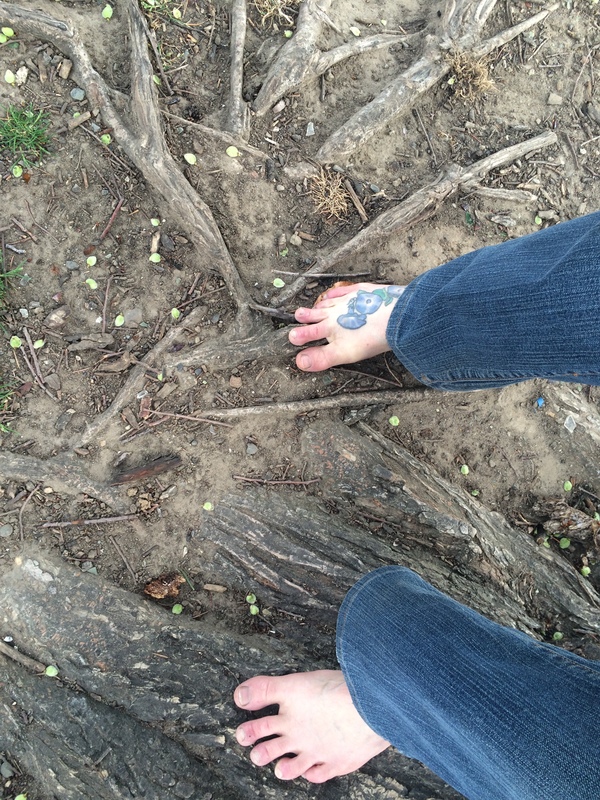 Move your feet in exploratory, weird, random, bizarre, strange, silly, varied ways. This can be done sitting in Dandasana (with your legs extended in front of you) or lying down. This is a great way to mobilize your feet before you get out of bed in the morning. Repeat throughout your day. Extend a leg behind you, pressing the top of your foot firmly into the mat. It is important to keep your pelvis back and stacked vertically over the knee & ankle of your front or support leg as the tendency is for it to drift forward. If balance is a challenge, please use a chair so that you can concentrate on the stretch without worrying about the balance.Hold for up to one minute. Repeat several times throughout your day. Lift the heels of both feet, coming up onto your tippy toes. Try to avoid letting your ankles blow out to the sides. If they do, then only raise your heels as high as you can keep your ankles stable. Hold for several seconds. Once you are skilled at balancing on both feet, start working towards one foot at a time. You can do this either by lifting the heels of both feet, but letting the work happen mainly in one foot; or you could do this balancing on one foot! Whichever variation you choose, make sure your hips are back. Hold for up to one minute. Repeat several times throughout your day. A half round (or half moon as one of students sweetly miscalled it) is best for this stretch, but you could roll up a couple of yoga mats or blanket or use a book. Place the ball of your foot on the top of the half round with your heel on the ground. Keep your other foot even to and pelvic-width apart from the stretching calf. You can advance in this pose by slowly stepping the non-stretching foot forward. If your pelvis moves forward with you or you lose balance or get rigid, bring the forward stepping foot back and don’t progress until you can do so in a relaxed and balanced stance with your hips back. Hold for up to one minute. Repeat several times throughout your day. I purchased a SPRI Half Round Foam Roller, 36 x 6-Inch that I cut down to one 18″ length and three 6″ lengths that I use for various purposes as yoga props. I’ll be posting later this week on hamstring stretching, but for now, start from tadasana, place your hands on your thighs and hinge forward at your hip joints, allowing your hands to slide down your legs, keeping your spine in neutral. As soon as your spine starts to deform ie round, stop, come up a few inches and work instead on lifting your tailbone, which will move the proximal muscle attachments for your hamstrings that are located on your sitting bones away from the distal attachments that are located on your lower legs, thus stretching these muscles. Hold for up to one minute. Repeat several times throughout your day. Place a new, firm tennis ball on a yoga mat or carpet. Keep your heel down as you drape only your toes over the ball, weighting it as much as you can tolerate. Very, very slowly, roll the ball under your toes, from side to side, allowing your toes to spread as you go. After a while move your foot forward so that the ball of your foot drapes across the ball. Again, move very slowly side to side. Continue to move your foot forward in small sections using a side to side motion. When you are deep into the arch of your foot, you might explore some front to back motions, or invert/evert your foot to get into the lateral and medial arches. The benefit from this massage comes when you slow down, take your time, move forward in tiny increments, hang out in sore spots, and remember to breathe. This can and should be done daily as a meditation practice. I will post our seated and supine exercises tomorrow. Your foot lives in a cave. A small cave. Rather, it lives in a cocoon. Actually, it mostly lives in a sarcophagus, which is like a cave, but with a cocoon for a sock. I’m pretty sure your foot is a mummy. Try this exercise to strengthen the muscles that spread your mummy toes away from each other. When you spread your toes, you strengthen the ABDuctors of the second through fifth toes as they ABDuct or move in the transverse plane away from the midsagittal plane (mid-line) of your body. But toe spreading ADDucts your great toe because it actually moves towards the mid-line of your body. Confusingly, the ADDucting muscle of the big toe was named ABDuctor Hallucis by early anatomists, at a time when the accepted axial reference line bisected the middle of the foot. 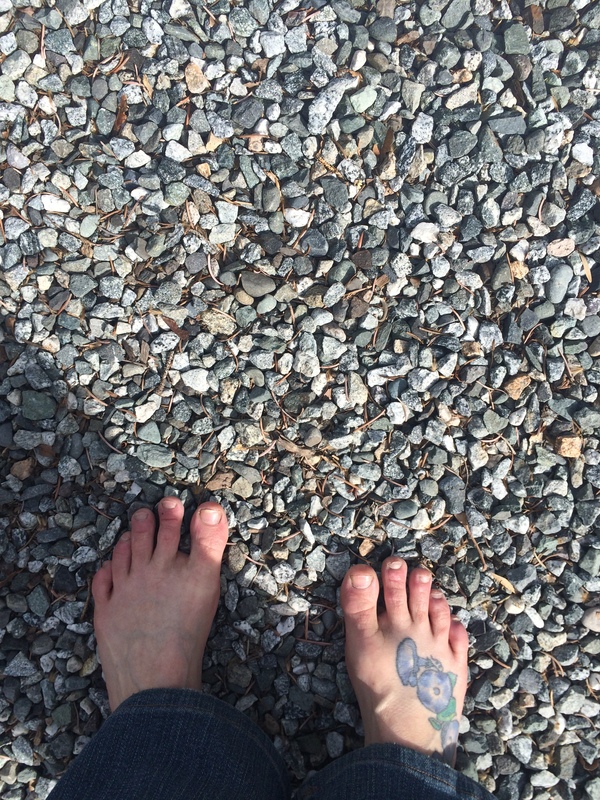 Strong toes are essential for optimal gait and balance. Strong toes have great blood flow and a healthy nerve supply. Place a thick rubber band around all of your toes and spread them. Hold this position for 5 seconds. Repeat 10 times. 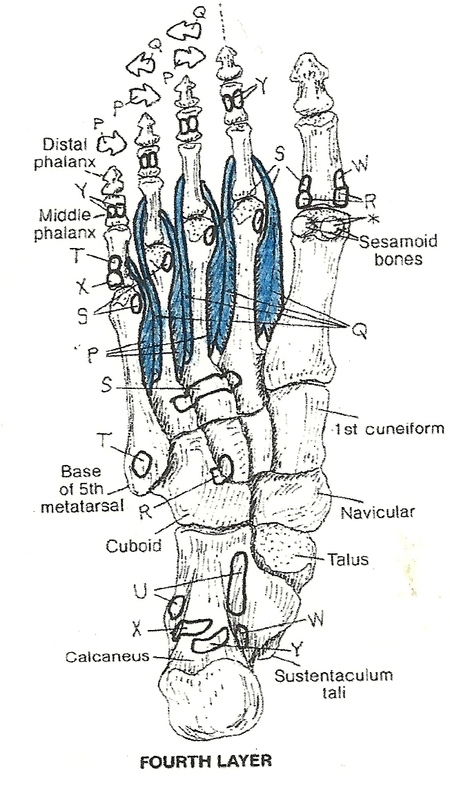 The blue muscles in the first illustration ABDuct or spread toes two through five away from your body’s midsagittal plane. 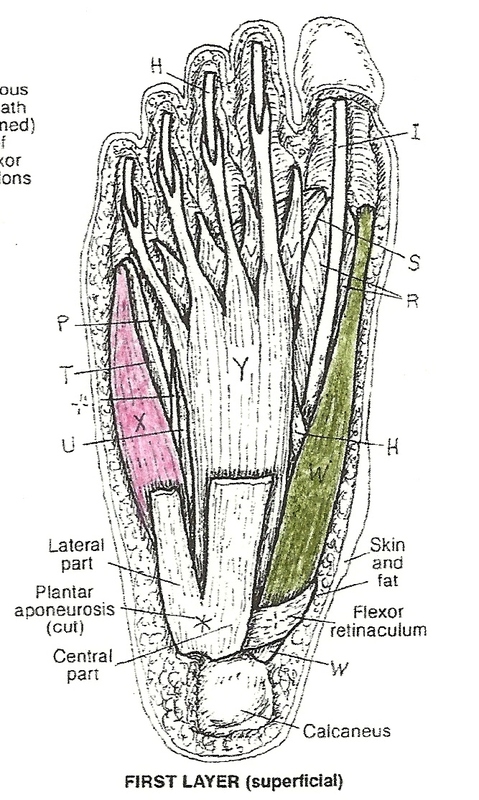 In the second illustration, the olive muscle ADDucts your great toe away from the others and towards your mid-line. The pink muscle ABDucts your pinky away from your other toes and your mid-line. May All Feet be Happy. May All Feet be Safe. 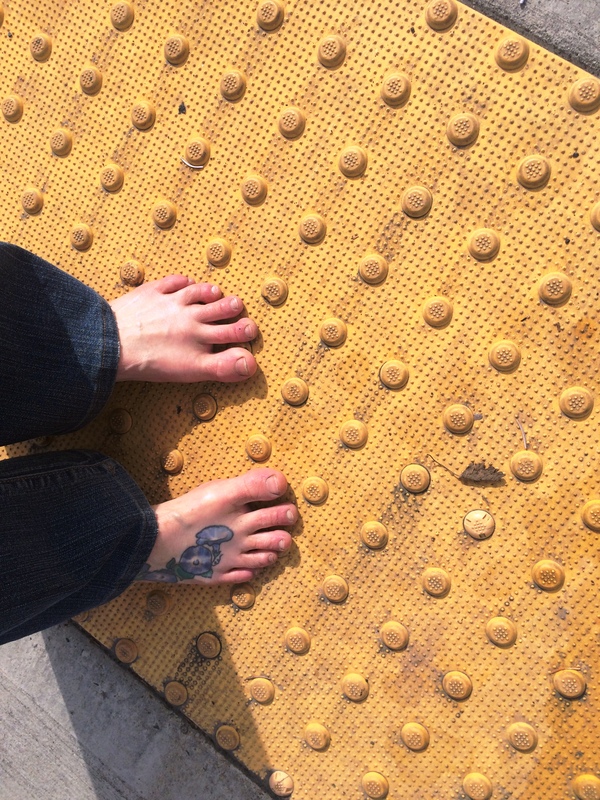 May All Feet Everywhere be Free. I am going to try to keep this brief, letting a few pictures be worth my usual thousand words. This is an x-ray, taken from above, of a normal bare foot. Notice the space between the metatarsals and phalanges aka long foot bones and toes. The bones are nice and straight and the toes are extended to their full lengths. This is a good looking foot. And it seems to be happy too. And free. These are images of a foot in a three-inch heel with a very narrow toe box, viewed from the top and the side. 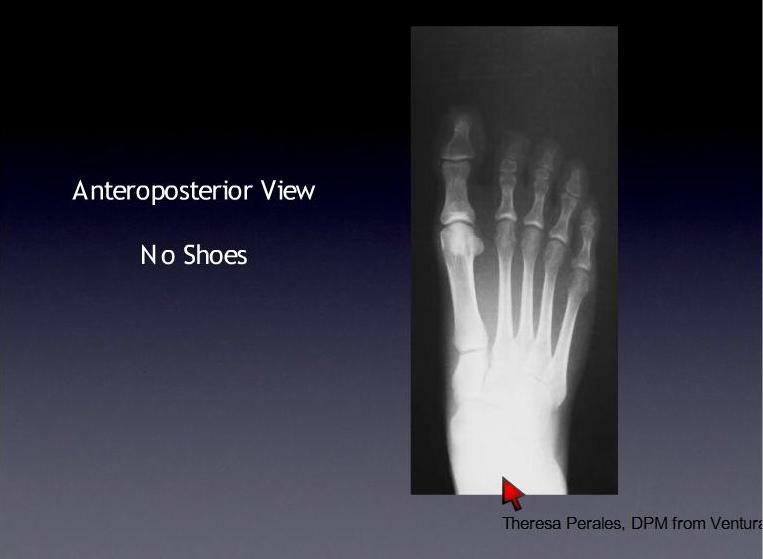 There is no longer space between foot bones at the proximal end. The great toe is deviating in towards the others and a bunion is forming before your very eyes. 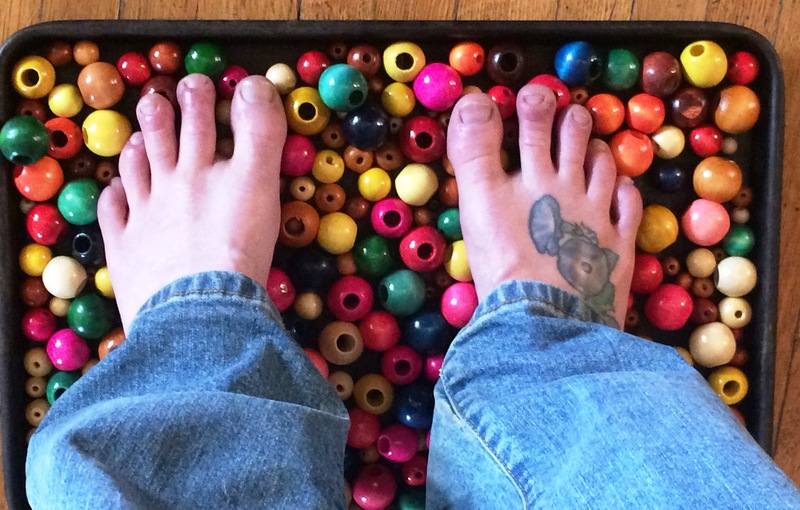 All of the toes are smashed together and none of them are extending to their full lengths, but are shoved up against an unforgiving toe box. I see Morton’s neuroma, which is a thickening of tissue around the nerve between the third and fourth toes that causes pain and numbness, in this gal’s future. A narrow toe box, like this one, pushes the smaller toes into a bent position at the middle joint and eventually their muscles become unable to straighten. Can you say hammertime hammertoes? And oh that heel. That glorious goriest heel. 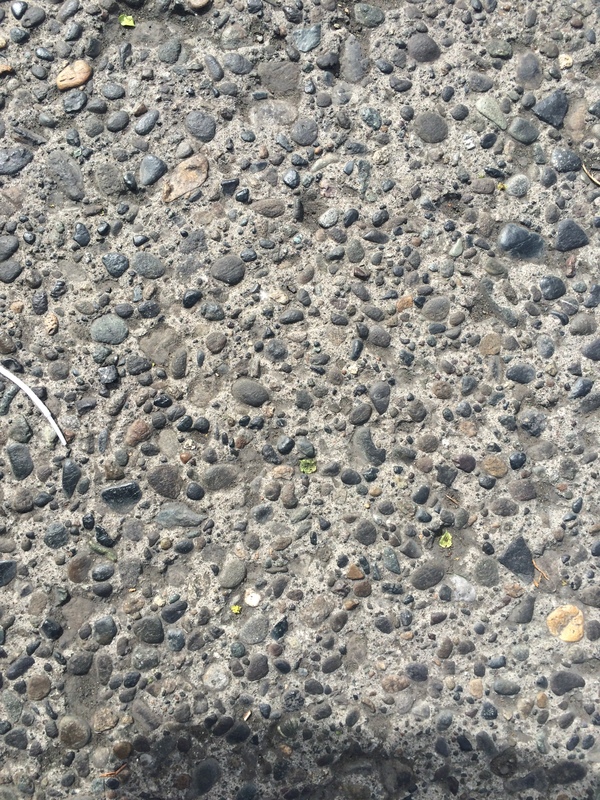 The bones of your feet are small and frail, like bird wings. Luckily, your foot is a biomechanical genius, madly engineered so that it can support and locomote you even with its small bird parts. But, those bones were designed to lie flat, not inclined to nearly 90 degrees. That changes everything. 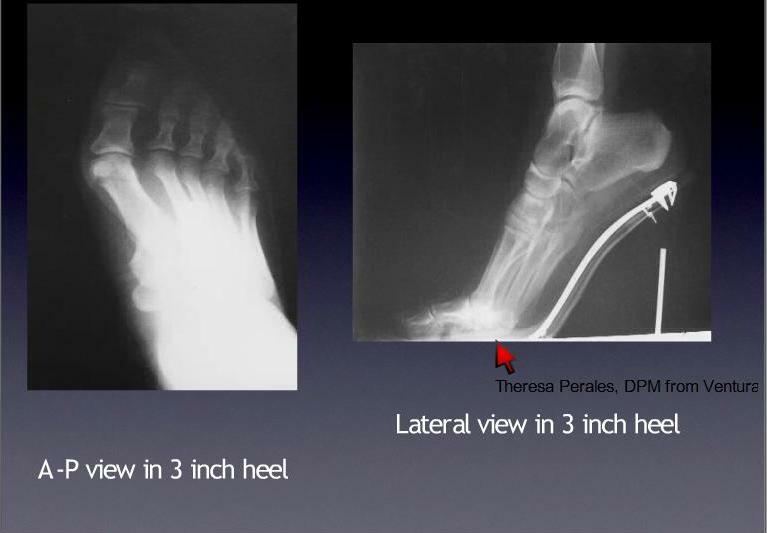 The list of conditions and degenerations caused by alignment-altering positive heels is so long, I can’t bear to type it, so I will hit some highlights: excess forces on the inner knee (as much as 26% higher for high heels) causing osteoarthritis; misaligned pelvis, hips and spine; increased pressure on the forefoot, which is a main ingredient for creating bunions, plantar fasciitis, and metatarsalgia; shortened calf muscles; Morton’s neuroma; achilles tendon and heel pain; pump bump; calluses, corns, and greater risk for sprained or broken ankles. Understand that this x-ray is showing only bones and not flesh, so this crammed foot is an even hotter mess than the imaging shows. This is a foot in danger of lifelong pain and perfectly positioned to wreak havoc on the rest of the body, particularly the positioning and viability of the pelvic floor. The wearer of this shoe better have some adult diapers on hand, cause she’s gonna need em. If you think this post does not apply to you because you do not wear high heels, I guarantee that unless you intentionally chose a zero drop or negative heel that your “flat shoes” have a positive heel. The average athletic shoe has a minimum 1 inch heel. And as the function fashion pendulum is beginning to swing away from “barefoot” shoes, the trend is for even higher heeled athletic shoes. And speaking of fashion? Who designs shoes with toe boxes more narrow than most toe sets? Who? Who?? Uh, almost every shoe maker on the planet. Shoes that don’t fit the width of our feet abound. While your resulting conditions and issues may not end up as as severe as the wearer of a 3 inch heel, chronic wearing of any heel higher than your bare foot will eventually lead to foot problems. It’s been proven by the largest, unplanned, completely natural study ever conducted. According to the American Podiatric Medical Association, the majority of Americans (77%) have experienced foot pain and half of all adults say that foot pain has restricted activities like walking, exercising, working, or playing. This is a tale of two feet. Which do you choose? 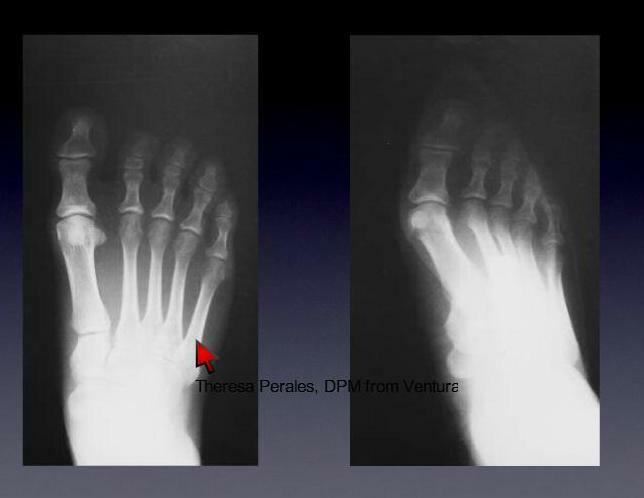 I credit the xray images to Theresa Perales, DPM, from a recorded presentation. 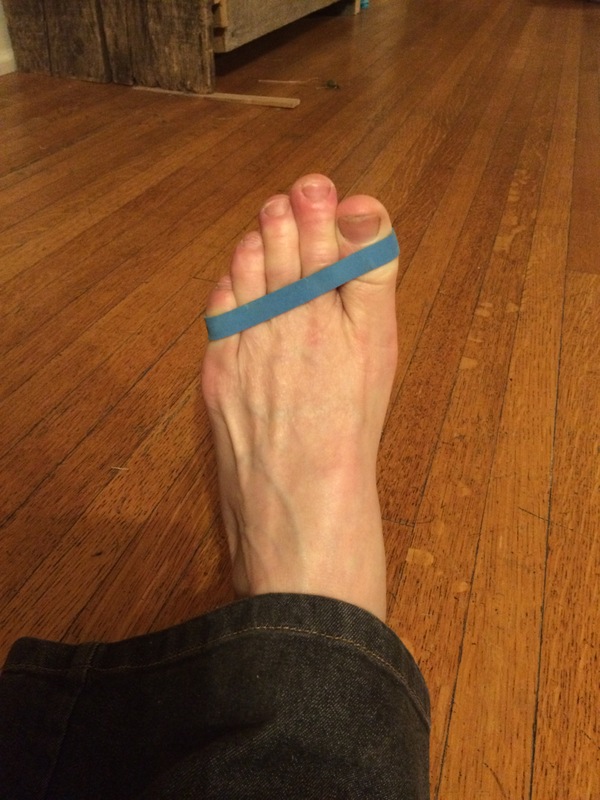 I’ve written about the purported benefits of engaging a strong yoga foot in past posts. It seems foot researchers are catching on to something yogis have been practicing for a long time. It’s called the “short-foot exercise,” but is essentially the equal of the strong yoga foot. Several recent small studies show promising benefits of the short-foot or strong yoga foot exercise for strengthening intrinsic foot architecture and improving postural stability aka balance. This is heartening as many health claims in yoga have arisen, unsubstantiated, out of various yoga lineages and proliferated through popular yoga publications and well-intentioned teachers. Proselytizing unsubstantiated health claims harms our profession. Your feet are complex and serve many functions in stability and movement. Standing, balancing, and walking gait require the arches of your feet to deform on command as the need for stability, rigidity, flexibility, and elastic energy storage and release quickly changes depending on what you doing. Add other forms of movement you might do – run, jump, dance, hike, climb, etc. and its apparent that you need strong, flexible, mobile feet with keen ability to propriocept or sense the terrain under them. Your intrinsic foot muscles, which have all of their attachments within the foot, are considered stabilizers (as opposed to the extrinsic muscles that have attachment points both on the foot and on the lower leg and are your movers). 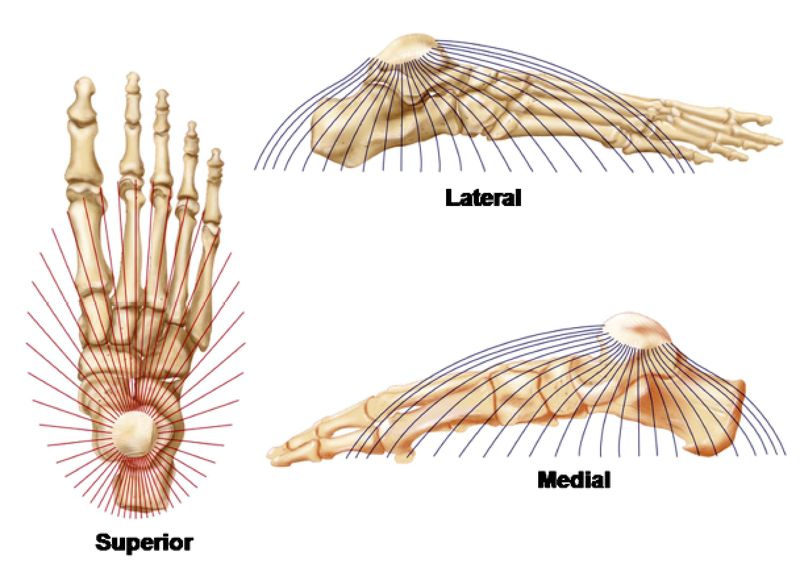 One of the main jobs of the intrinsics is to support the four arches of your foot (medial, lateral, and two transverse) that one could envision as a half dome. It is this half dome that must deform properly in all types of movements – standing, balance, walking, running, dancing, etc. With each step you take, your intrinsic foot musculature acts to control deformation of this half dome of arches. When these muscles are not functioning properly because they are weak and uninnervated, your foundation is unstable and misaligned and thus abnormal compensatory movement occurs. I’ve written previously on how foot turnout and a forward pelvis can wreak havoc with your feet. Imagine what abnormal foot biomechanics in movement might do?? Several conditions immediately come to mind – plantar fasciitis, bunions, metatarsalgia, Morton’s neuroma, and pes planus or flat feet. A weak medial arch (that’s the long arch on the inside of your foot) is one possible cause of flat feet, which, if you have them, negatively impact your other weight-bearing joints with friction and subsequent degeneration. Your flat feet have weak plantar muscles that fail to function optimally in their crucial roles as shock absorbers, in gait efficiency, and as postural stabilizers, making balance difficult. And, oftentimes, they just plain hurt. If your feet are flat, your medial arch is missing, which means your half dome cannot deform to provide necessary transitions from rigidity, flexibility, and energy storage and release that propel you forward when walking or running. When your arch doesn’t store and release elastic energy in gait, you are having to work exponentially harder to move forward. Your flat feet are exhausting. The strong yoga foot or short-foot exercise is used to reinforce the arch of the foot by strengthening the plantar muscles – the four muscle layers on the bottom of your foot, predominantly your abductor hallucis, which is the most superficial and easiest to measure of the intrinsic muscles. By contracting the foot’s intrinsic muscles, the long medial arch is shortened and its angle increased. 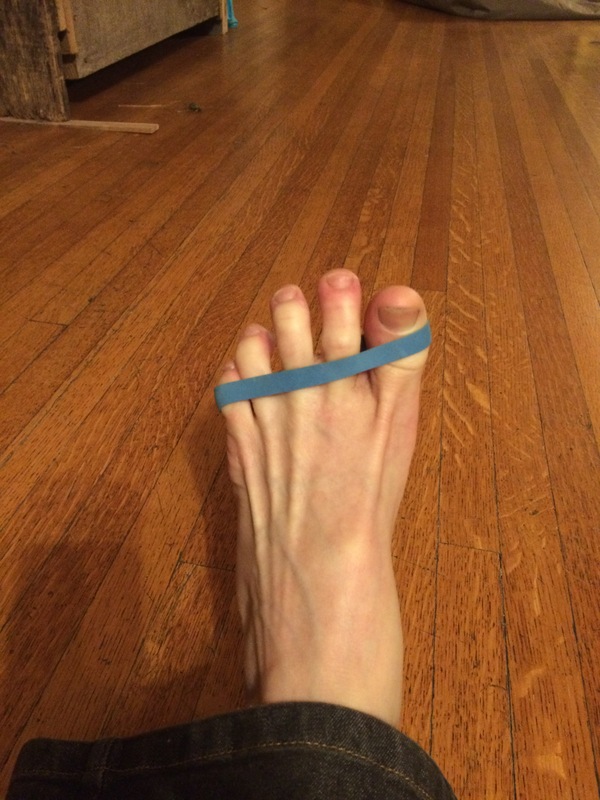 This lift of the arch lowers the mediolateral center of pressure (the pressure on the part of your flat foot that should be arched), and increases pressure of appropriate contact areas of the foot (forefoot and heel) on the floor stimulating cutaneous and muscle receptors, which help you to right yourself in the context of balance. Essentially, a strong arch is crucial to optimal gait and balance. Research shows that the short foot exercise reduces arch collapse, improves balance ability, increases big toe flexion strength, and improves function in chronic ankle instability. The short-foot exercise is performed by shortening the foot in a front to back direction – the first metatarsal head (aka the base of big toe; big toe mound; or ball of the foot in yoga speak) is drawn toward the heel without flexing or curling your toes. The forefoot and heel touch the floor, while the medial arch lifts. The short foot exercise can be performed either sitting or standing for improving strength, but should be practiced while standing if using this exercise to improve balance. When standing, it can be done bipedally, meaning both feet on the ground, but only one foot should be working; or unipedally – balancing on only one working foot. Placing the ankle into passive dorsiflexion by inclining the foot 30 degrees on a board or yoga wedge results in higher activation of abductor hallucis than that of the typical, neutral short foot position, possibly due to length-tension relationship in which optimal muscle length generates the greatest muscle force. The exercise is repeated 3 times for 5 seconds per rep, making one set. Sets of three reps are repeated 5 times, with two minutes of rest after every set. Alternatively, sets could be spread throughout the day. lower your kneecaps by relaxing your quadriceps to minimize the amount of friction/degeneration in your knees. The following studies informed this post and are available free, in full text on PubMed. The foot core system: a new paradigm for understanding intrinsic foot muscle function. McKeon, PO et. al. Br J Sports Med. 49:290, March 21, 2014. EMG Activity of the Abductor Hallucis Muscle during Foot Arch Exercises Using Different Weight Bearing Postures. Goo YM, Heo HJ, An DH. J Phys Ther Sci. 2014 Oct;26(10):1635-6. The Effect of an Inclined Ankle on the Activation of the Abductor Hallucis Muscle during Short Foot Exercise. Heo HJ, An DH. J Phys Ther Sci. 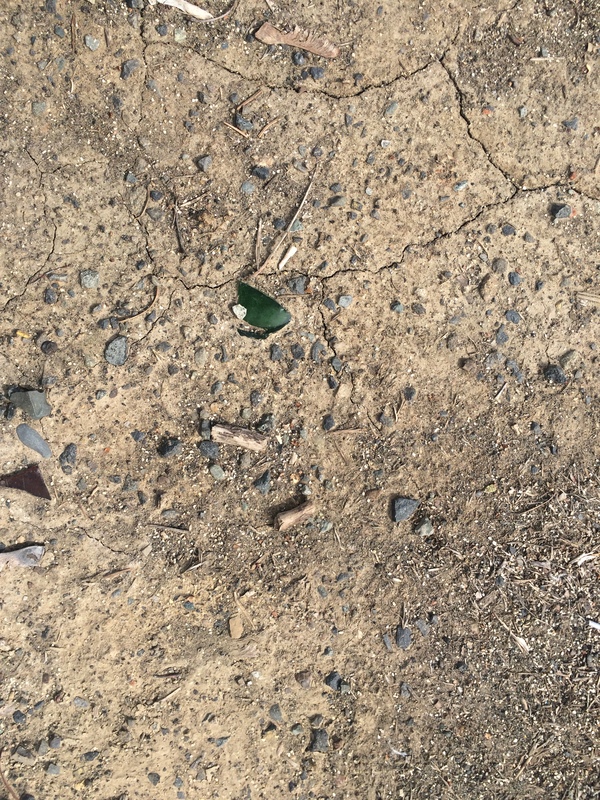 2014 Apr;26(4):619-20. Immediate Effect of Short-foot Exercise on Dynamic Balance of Subjects with Excessively Pronated Feet. Moon DC, Kim K, Lee SK. J Phys Ther Sci. 2014 Jan;26(1):117-9. We spend most of our waking time wearing shoes and when we walk, it is on flat, artificial surfaces. Thus, the intrinsic muscles of our feet are weak and feel tight and have limited ranges of motion and almost no dexterity. We are a nation racked by painful feet, fallen arches, and dependency on orthotics and orthotic-like features designed right into our shoes that keep us further than ever from healthy, strong feet with great circulation and dexterity. I write and study at a standing work station – sometimes for hours. I am constantly cycling through various exercises and props to strengthen, stretch, and mobilize my feet, ankles, and lower legs. 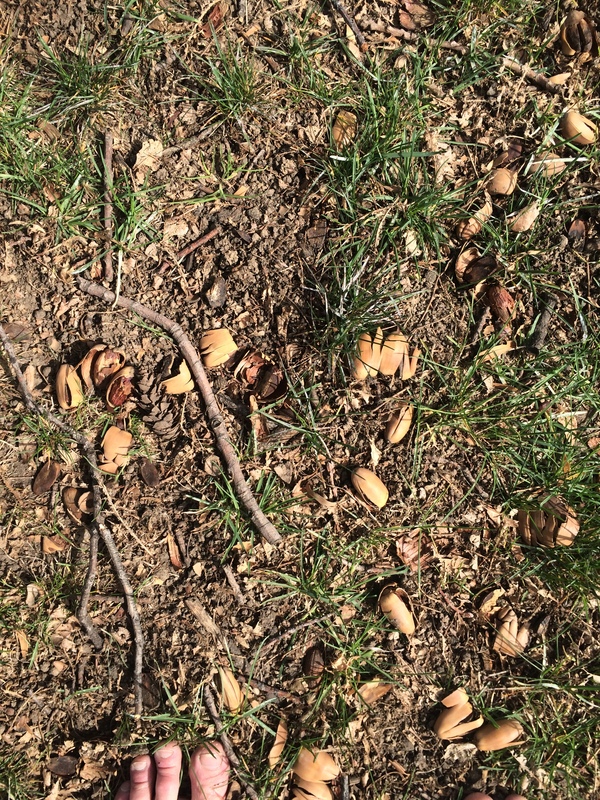 To stimulate and innervate the bottoms of my feet, I often drape my weighted foot over a tennis, lacrosse, or racquet ball, as i wrote about last month. 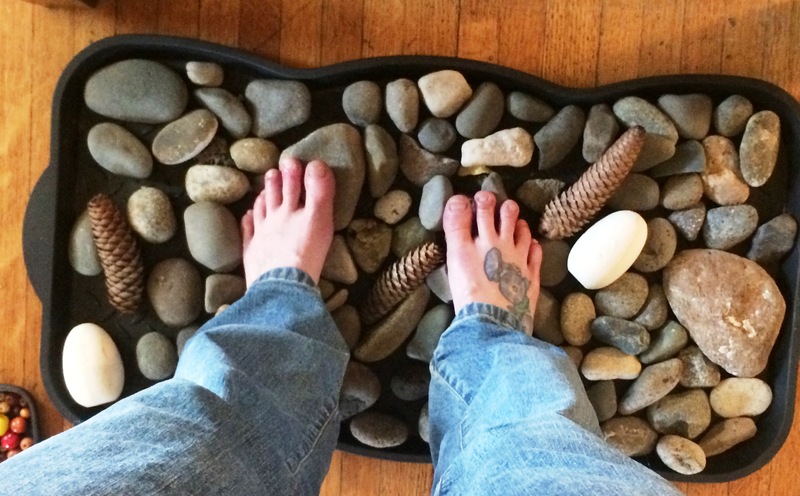 But I’ve been dreaming about making a DIY cobblestone mat to help prepare my feet for what should be a full Spring, Summer, and Fall of daily barefoot walks on natural terrain. So, finally, I got busy. While neither is quite finished and I have several others planned, check out the newest editions to my foot prop collection. 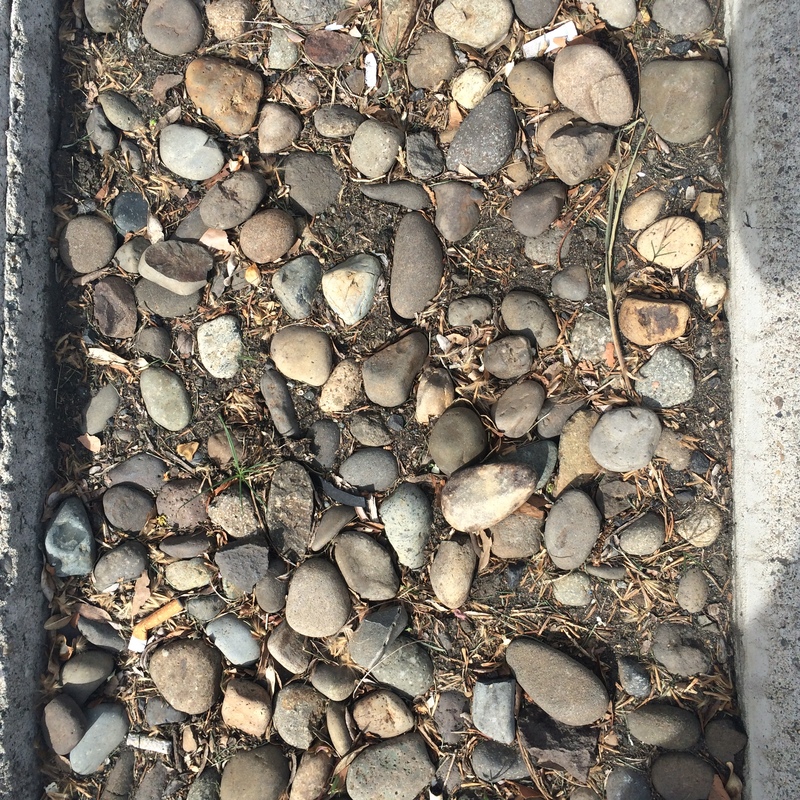 Smooth landscaping stones, a few pine cones, and a couple of wooden darning eggs are spread out in a boot tray. I still need to fill in a few spaces. The large size of the tray allows a vast array of foot positions, which means my feet (and therefore my entire body) experiences a vast number of loads to the tissues. 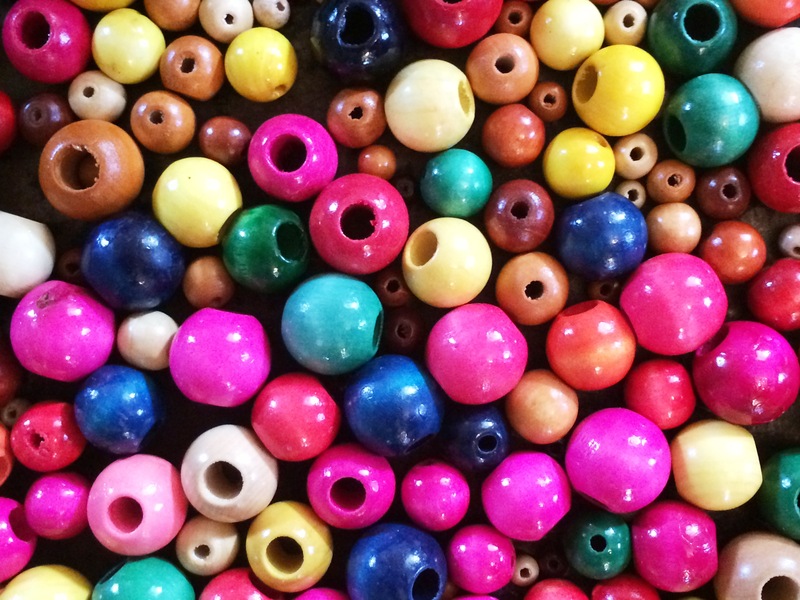 While not natural, I appreciate the loads provided by these wooden beads. 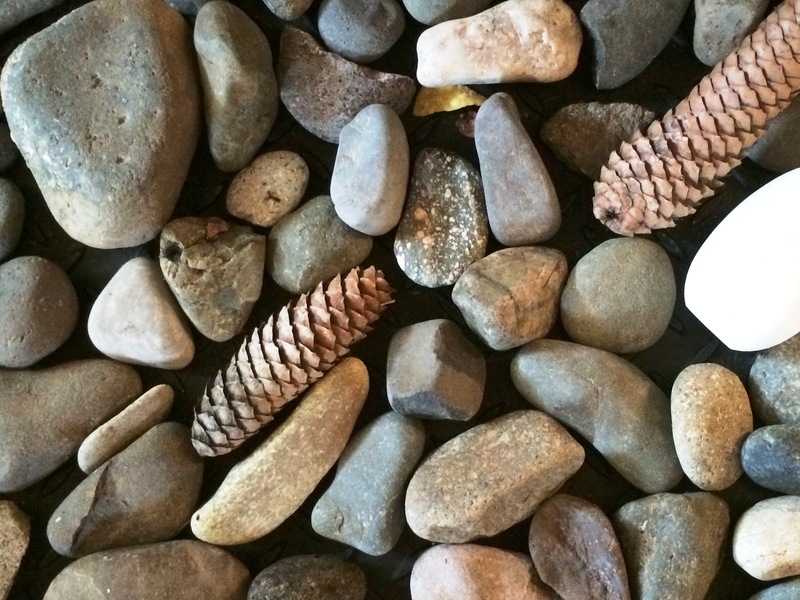 They feel a a bit sharper than stones, more like gravel. The bright colors are cheerful and make me happy whenever I look down at my feet. These beads are temporarily renting space on a cookie sheet, but will soon be moving into a more permanent home on another boot tray. 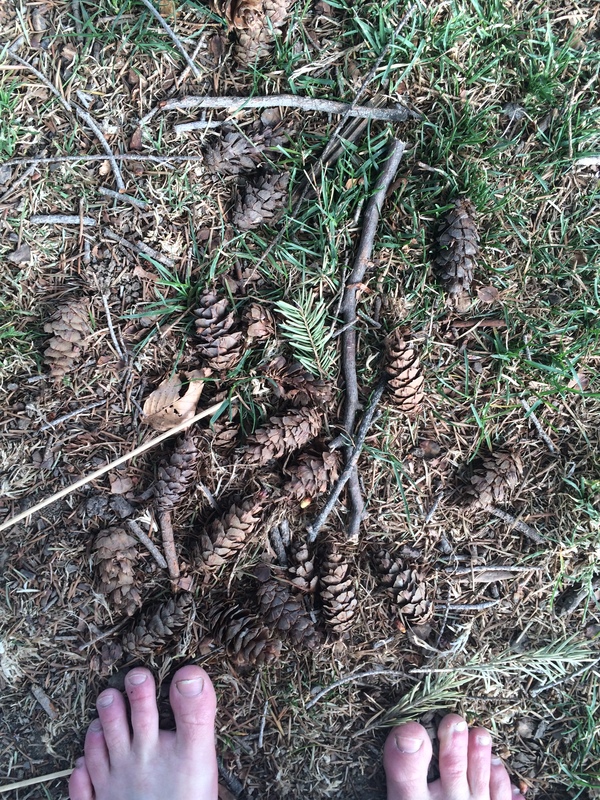 If your feet are painful, feel tight, and are not very mobile, please spend several weeks doing the many exercises I write about on this blog. Continuing with the exercises, spend several more weeks walking barefoot inside on carpet, linoleum, wood, in that order. 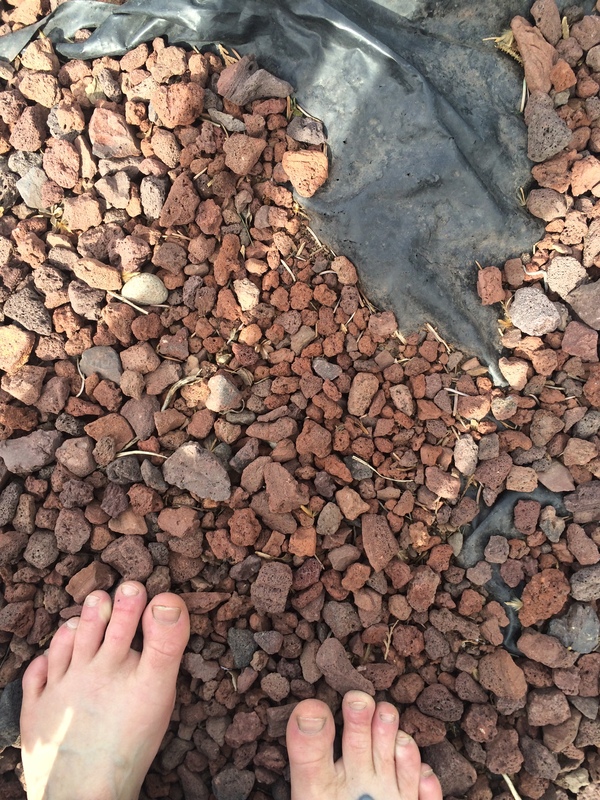 Start with less time and increase your barefoot time as your feet get used to the new loads. Continuing with the exercises and barefootedness, spend several more weeks draping and rolling your foot over a tennis ball. 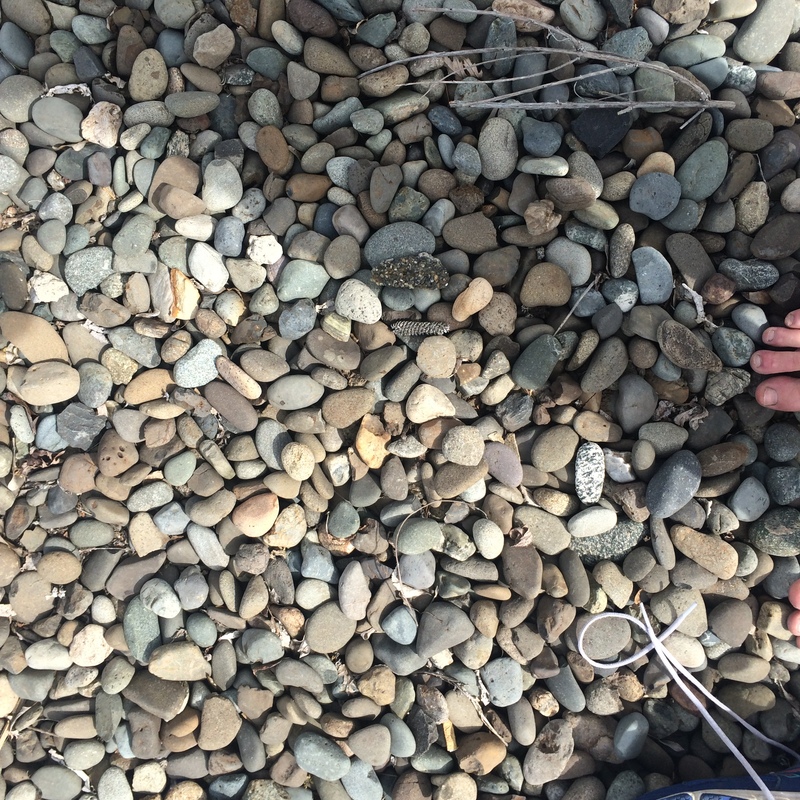 You could injure your feet if you go from zero to stones & beads too fast. Seriously. You’ve gone this long, what’s your hurry?